Contemporary wood-heating devices come in many shapes and sizes, from stand-alone stoves that heat their immediate surroundings in small spaces, to installations resembling mini district heating plants for combined central heating and domestic hot water. These fact sheets focus on small combustion units for homes and their ancillary components. building can be heated comfortably with a relatively small unit, as compared to a building with no/low insulation levels, single-pane windows, and gaps and cracks in floors, walls and ceilings, and around pipes, window and door casings. 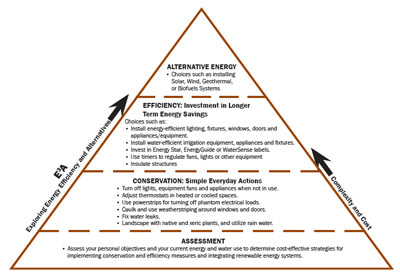 Use the E3A Energy Management for the Home series to take energy conservation and efficiency measures prior to investing in a wood-burning device. Wood is usually used for space heating, so levels of insulation and air sealing are especially important to consider. Efficiency measures will reduce the size and cost of the system needed to heat the space. affect the ability of the combustion unit to draft and burn properly. Heat moves as electromagnetic waves through empty space as radiation. 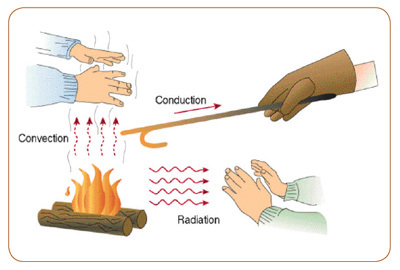 Conduction occurs when heat energy is transferred through solid matter along a temperature gradient, from warmer to cooler. Convective heat transfer (often called convection) is the transfer of heat from one place to another by the movement of fluids (including gases, like air). When the molecules in the air come in contact with a hot surface, they separate and scatter, which makes the gas less dense. Cooler gases are denser and sink as the hot air rises. The exchange between hot and cold fluids results in circulation of the fluid and over time, the temperature of the entire fluid rises if minimal heat is lost. The following fact sheets will discuss both how the combustion units are designed to transfer heat as well as considerations for improving the thermal energy of wood heat in the design and installation processes. Room/Area Heat: A combustion unit that heats a single room or adjacent area. Usually has no ducting/piping to distribute heat to other parts of a building and is made of cast iron, steel, or stone. Examples are the common wood stove, pellet stove, or fireplace. Central Heat: A combustion unit that commonly has ducting and blower (distributing air) or piping and pump (distributing water) to distribute heat to other parts of a building. Usually installed in basement, utility closet, or separate outbuilding. Hydronic: These combustion units heat a heat-transfer liquid (water or antifreeze) that is piped to provide heat and hot water to occupied buildings such as homes, barns and greenhouses. May also be located indoors. Single Fuel: Units that generate heat from one form of fuel. Flex Fuel: Commonly refers to units that can generate heat from a variety of similar fuels (e.g., renewable solid fuels, like wood pellets, corn). Multi Fuel: Commonly refers to units that can generate heat from a variety of dissimilar fuel sources like wood, coal, and even oil in a single unit. Cordwood: The traditional “firewood”, cut, split and stacked. wild grasses, and dedicated energy crops (e.g., switchgrass, reed canary grass) are being used to make pellets. Wood chips: Chipped wood, usually used on a commercial or industrial scale.